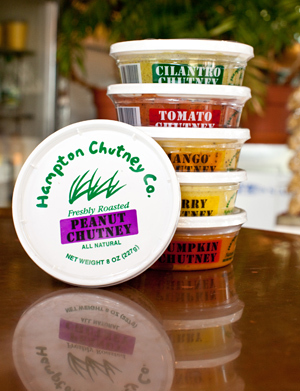 Hampton Chutney Co. New York - WHAT IS A CHUTNEY? Chutney: noun (pl. chutneys) a spicy condiment made of fruits or vegetables with Indian spices. The fresh chutneys from Hampton Chutney Co. are changing America's perception of traditional chutneys. Hampton Chutney Co. chutneys are a rich, flavorful and a intriguingly complex blend of tastes. That complexity is revealed by reading the label of any one of the six flavors: Cilantro, Mango, Tomato, Curry, Pumpkin or Peanut. 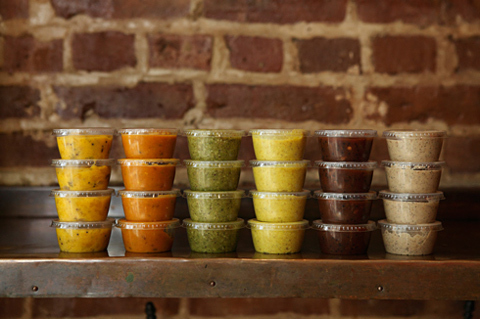 The Cilantro chutney, for example, is composed not only of cilantro, but coconut, dates, chilies, ginger, lemon juice, a handful of spices and a touch of salt. The freshness of the ingredients literally startles people who try them. Hampton Chutney chutneys are quickly replacing run-of-the-mill condiments, salsas, and sauces in everyday dining and entertaining. CILANTRO: An emerald-green chutney excellent tossed with shrimp or basmati rice; serve aside roasted or grilled chicken or fish; add to black beans for the perfect quesadilla filling; fold into tuna salad instead of mayonaise; even delicious on pasta dressed with roasted or grilled vegetables; or simply use as a dip with tortilla chips. MANGO: Tropical yellow and flecked with spice, this is the ultimate condiment for all fish and seafood; also scrumptious with lamb or pork; spread on crackers and serve with an English Farmhouse cheddar or on baked brie; makes a wonderful sandwich with grilled chicken and cucumber slices; toss with tomato and avocado cubes for a delicious topping on grilled fish. PEANUT: A creamy, nutty, mocha-colored chutney that's wonderful with crudite or as a dipping sauce for chicken; toss with soba noodles and sprinkle with fresh cilantro; mix with stir fried or steamed vegetables and serve over rice; thin with water and use to baste grilled shrimp, chicken or vegetable skewers; spread on apple slices or use as a dip for pretzels. PUMPKIN: A hearty, rich orange chutney that's great on a roast turkey sandwich; fold into sour cream for a delicious baked potato topper; add to your bread machine recipe or biscuit mix for a savory taste; mix with fat-free cream cheese for a mouth-watering dip with pita wedges; try it on your morning bagel. CURRY: A golden-hued sauce perfect for marinating chicken and vegetables; a wonderful crudite dip or hors d'oevre spread with cheese and crackers; swirl into a cold cucumber soup; dip shrimp or lobster into it; mix with low-fat mayonaise for a delicious artichoke dipping sauce or a dressing for grilled chicken salad. TOMATO: Ruby-red and naturally sweet, this chutney tastes great on burgers or mozzarella sandwiches; adds zip to pasta; makes an exciting cocktail sauce or marinade for shrimp; spread atop melted cheese on a pita for a delicious homemade pizza; it's even great with scrambled eggs.